Yes. 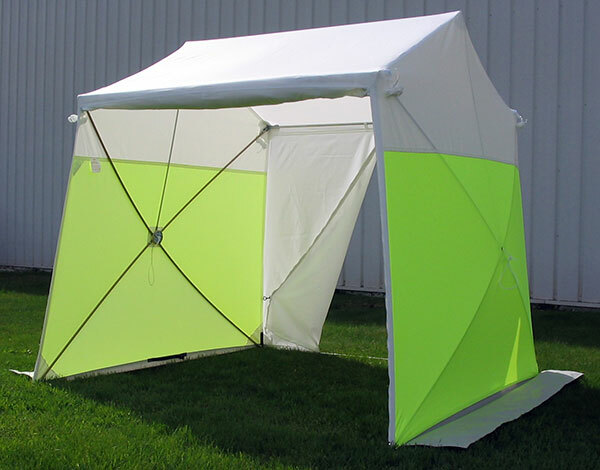 We offer a variety of customizable options to our standard tents such as safety stripes, extra windows, and more. In addition we can provide a fully customized tent to your specifications. Are the covers/tents flame resistant? The fabric used in our tents meets CPAI-84 standards. We also carry fabric that meets NFPA-701 standards. Contact us to find out more. How are the tents setup? Pop’N’Work tents can be set up in less than a minute. With the unified frame there are no loose parts to assemble. Check out this short video to see how it’s done. Yes. Pop’N’Work tents are designed for work. The frames are made to last with sturdy cold rolled steel and fiberglass. In fact, we guaranty the frames on our tents for 2 years. Contact us for more details. Where can I buy Pop'N'Work products? Contact Creative Tent Solutions via phone at 272.728.2686 or using our quick online contact form, and we’ll gladly connect you with options for purchasing our products.